Potty training can be a total drag. 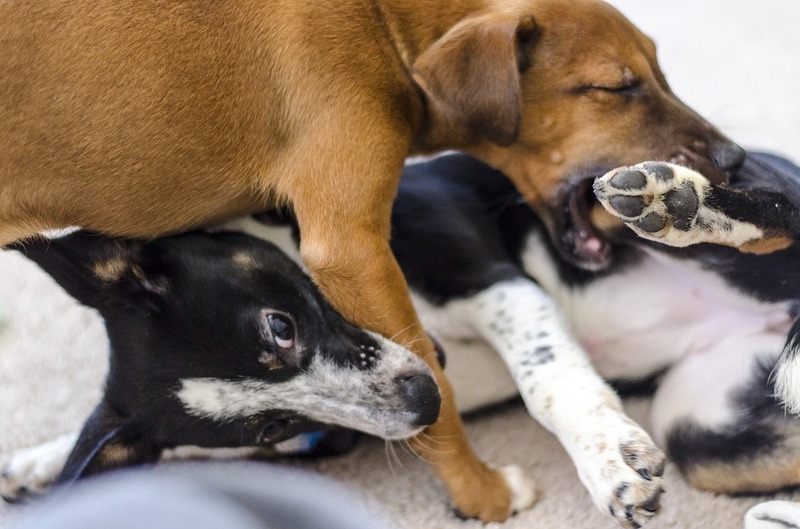 It seems like our dogs and puppies learn all the wrong lessons at first! With young puppies, we can chalk this up to lack of bladder control. But what about with an adult dog? It’s pretty common for dogs and puppies to pee on the carpet, even after a bathroom break. In today’s Ask a Behavior Consultant, we’re tackling this problem. I live in an apartment and [my two-year-old retired show dog] is in a playpen with food, bed, and toys. There is also a puppy pad for her. She only goes potty when she’s on the carpet. [I praise her when] she pees and poos in the playpen and gives treats when she’s inside but she still comes out and pees shortly after she’s been let out. It’s always a bit surprising to me how many adult rescue, shelter, or purchased dogs are still not potty trained. In Pom Mommy’s case, she purchased a two-year-old retired show dog, only to find out that her new Pomeranian isn’t potty trained. Pom Mommy is finding that her new dog will pee on the carpet, even if her dog has potty pads accessible. In this case, it’s likely that Pom Mommy’s dog was never potty trained in the first place. Perhaps the dog was raised in a kennel environment or outdoors. It’s hard to say – but apparently the potty training lessons didn’t take hold. If your dog is peeing indoors, it’s probably because she was never fully potty trained in the first place. This is especially true for puppies or dogs with unknown histories. If your dog was previously housetrained, be sure to take her into the vet to ensure that it’s not a UTI, medical condition, or stress-based response. Peeing on the carpet is common because, to a dog, it seems totally sensible. Carpet is absorbent, helping avoid getting your dog’s paws wet. It’s also outside of your dog’s crate/den/play pen area, so it’s a great place to go! That’s probably why you notice that your dog holds her pee and then pees outside – she doesn’t want to pee where she sleeps! Praise alone isn’t cutting it for this little dog. While some dogs can learn new skills in response to praise, most dogs need to be paid a bit better. We can relate – most of us prefer to get a paycheck instead of just a “thank-you” (especially from a boss)! Potty training a dog is labor intensive, there’s no real way around it. The thing is, right now Pom Mommy’s dog probably doesn’t know that she can cash her pee in for food! The dog also probably doesn’t know that peeing on the carpet is a problem. It’s generally best to start potty training all over again from scratch. This will help us start off on the right paw and fix all of our problems. 1. Take Your Dog Outside Regularly. Reward Heavily. Set a timer if you need to. I recommend starting with every hour, on the hour. If your dog pees outside, give her a treat (I really like the Blue Bits from Blue Buffalo because you can split the hearts in half for little dogs). Reward heavily. If you want your dog to use potty pads as well, you also need to reward your dog with treats every time she pees on the potty pads. 2. No Playtime for “Full” Dogs. Use Confinement Wisely. If your dog is not “empty,” your dog cannot be unsupervised. So if your dog hasn’t peed recently, she needs to be inside of a playpen, inside her crate, or on a leash. Use the umbilical training method or a playpen for the rest of the time. If your dog isn’t empty or being directly supervised, your dog needs to be contained. I use a training tether (see below) to tie my dog to the couch, doors, or my chair. Everywhere I go, she goes. That’s the umbilical method – it helps you keep a close eye on your dog. If you’d rather not do that, use an exercise pen instead (see below). Watch your dog. If she starts to circle, sniff, or squat (or lift a leg, for boy dogs), scoop her up and carry her outside or to the potty pad. Try not to make this scary! 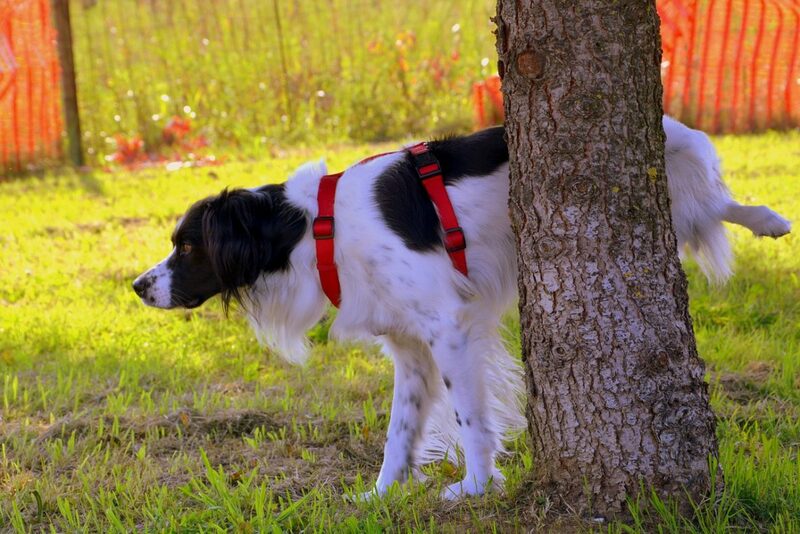 You don’t want to teach your dog that peeing in front of you is scary. If she pees outside or on the potty pad, reward her heavily. 4. Be patient. View Mistakes as Learning Opportunities. If there’s a slip-up and your dog pees on the carpet, try not to get angry. Don’t scold, swat, or show your dog what she did wrong. Instead, learn from your mistake. You’re the one with the big brain and the thumbs. What happened that allowed your dog to have an accident? Then try to fix that! Be sure to super-clean the areas with something made specifically for dog urine. Your household cleaners might clean up the sight and smell of your dog’s pee to YOU, but you need something that will break down the enzymes so your dog doesn’t smell your carpet as a bathroom! I use Nature’s Miracle Carpet Shampoo for my foster dogs and puppies. Unfortunately, potty pads are pretty tricky for many dogs. It’s just not obvious to most dogs that a potty pad is all that different from carpet, newspaper, or other common household items. Instead, I recommend using a puppy litter box (see below). Even better, teach your dog to pee outside! Again, the difference between a puppy pad and the carpet is just not obvious to most dogs. Potty training can be a chore – but it’s worth it not to have to clean up dog pee indoors all the time! With patience, consistency, and a few treats, you’ll get there.